Frankly, this is all looking frighteningly familiar. Dapper dance-happy continental duo turn up with a debut album that proves to be both ubiquitous and sublime, return after four fallow years with a sophomore set of similar glories, and determine that the Olympic-style release schedule is clearly the way forward. Alas, the first time we saw this it led to the thus-far-closing chapter of the all-too-appositely-named Human After All, which barely counts as a happy ending by anyone's standards. Still, surely Royksopp wouldn't be that daft, would they? Admittedly, the early signals are mixed: as a lead-off single 'Happy Up Here', while far from squelch-shy and suffused with a suitable jollity, is unusually uneventful, particularly when compared to its earlier counterparts 'Eple' and 'Only This Moment'. Yet there's much encouragement to be drawn from a guestlist of fearlessly enviable proportions - they've done tremendously in luring Robyn on board, while Bel Canto's Anneli Drecker is a further welcome cohort, and there's much joy to be had just from the prospect of hearing new material from The Knife's Karin Dreijer Andersson. Thankfully, though, it's that level of discernment that chiefly seems to have won the day where compiling Junior is concerned. Perhaps unexpectedly given their somewhat glacial reputation, it's an album high on genuinely kinetic thrills, and something of a showcase for a towering structural virtuosity akin to earlier technical titans such as Orbital or Leftfield. These traits are best evidenced on a couple of the collaborative efforts here. That aforementioned Robyn-assisted endeavour 'The Girl And The Robot' is not only blessed with a near-perfect retro-futurist name and lyrical motif, but also piles synthesised choral swells over a buzzing Moroderian throb and a 'The Days Of Pearly Spencer'-resembling treated piano run. The second of the Andersson affairs, 'Tricky Tricky', emerges in a swathe of malicious and ever-widening spacehopper synths before blossoming just after the halfway mark into a heartbeat-hammering multi-part electro odyssey - but, in truth, they're present throughout. Indeed, in further good news, Lykke Li's never sounded quite as outstanding as she does on the thoroughly lovely 'Miss It So Much', a nodding puppy of a track that's affectionately indebted to the unlikely source of 'Equinoxe'-era Jean-Michel Jarre which manages to rein in her twee-er excesses to mildly magical effect. There's also some terrific wrestling with The Funk on the deliciously dislocated 'True To Life', helped no end by an amusedly playful bassline, a drizzling of ticklish guitar and some Drecker vocals that approach the notion of an enraptured Sarah Cracknell. In fact, even on their own Royksopp prove anything but complacent. 'Silver Cruiser' may arguably segue a little too comfortably with their own 'Triumphant' (although, given that that's probably the track that those that don't know them most nearly know them for, what with its frequent X Factor abuses, that's perhaps understandable), but 'Royksopp Forever' is a huge goal, a hovering and darkly poised string-laden delicacy not unfamiliar with the territory stalked by both Jeff Wayne's War Of The Worlds and the often-overlooked Mirwais-Madonna gem 'Paradise (Not For Me)'. Again, it's a wilfully bizarre melange of influences, but one that yields charming, coherent results and promises much for the forthcoming companion album - called, with some predictability but no little pleasure, Senior - they'll be launching before the year's out. 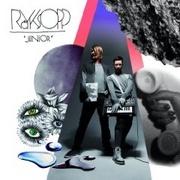 This could so very easily have been the point at which Bruntland and Berge squandered their flawlessly-fought legacy, but, brilliantly, Junior is anything but the runt of Royksopp's litter.